It’s a Thursday night, it’s -6 degrees outside, the tube drivers are striking again and I’m pretty sure I’ve picked up a bug from the office air conditioning (germ blower). Something pretty special would be required to keep me from joining the hordes of rush hour commuters to get home as fast as my legs can carry me, don my lounge outfit and throw Netflix into action like a lazy Batman. 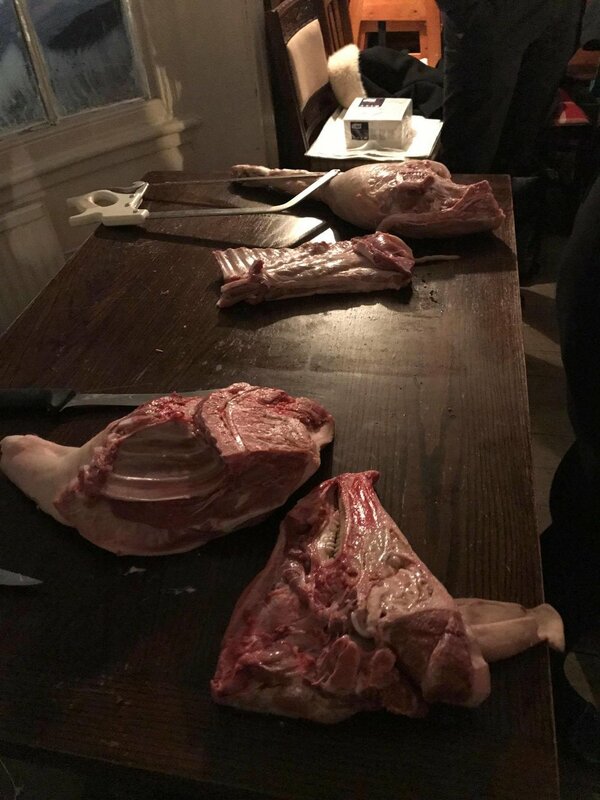 That something special came in the form of an invitation to a ‘Bourbon & Butchery’ evening at the Cutty Sark pub in Greenwich, London. “You had me at bourbon” I told myself as I responded with gratitude. There is actually a tenuous whiskey link to this venue, a pub named after the great 19th Century ship now a tourist attraction, named after a witch in a Robbie Burns poem that was afraid of water, Robbie Burns we all know from having raised our annual dram the previous night in respect of his ‘Ode to the Haggis’. Come on, it’s a far better link than the three degrees of Kevin Bacon…….which leads me nicely on to the activity for the evening! Our compere for the night was bar manager ‘Alex’ whose enthusiasm did not stop at his witty repartee, he wore a Captains hat to deliver his first introduction of the night from the ‘Crow’s Nest’ room nestled at the top of the pub. Artisan butcher ‘Jess’ stood in front of a heavy set wooden table where atop lay a cross section of a pig and a selection of pointy metal objects, referred to in the butchery industry as ‘knives’. “Look at the size of the brain!” said the charming lady next to me as Jess showed us just how small it was whilst oddly invoking the only chorus of disgust of the evening by waving the flaccid tail. Split an animal in half, prod and poke it as you please, but waving its tail just makes it real (until Tesco start selling it in packets). To dull the senses to this horror scene of tail waving, we were treated to some cocktails made by both Alex and Brown-Forman brand representative ‘Jeevan’ that went down a treat. No sooner had we finished our expertly procured Old Fashioneds made with Gentleman Jack than we had forgotten the image of that tail and taken it in turns under the tutelage of Jess whilst wearing a funky chainmail glove to trim the meat into what we are all comfortable seeing as food. Safe in the knowledge that I can now survive in the wilderness of Essex, hunting wild animals to cut into neatly trimmed portions (if Tesco ran out of it in packets) I proceeded to try the next few drinks put in front of me by Jeevan, Jack Daniels Old Number 7, Gentleman Jack and Woodford Reserve whilst listening to a well delivered overview of the brand history before closing the night to applause of appreciation for our hosts. 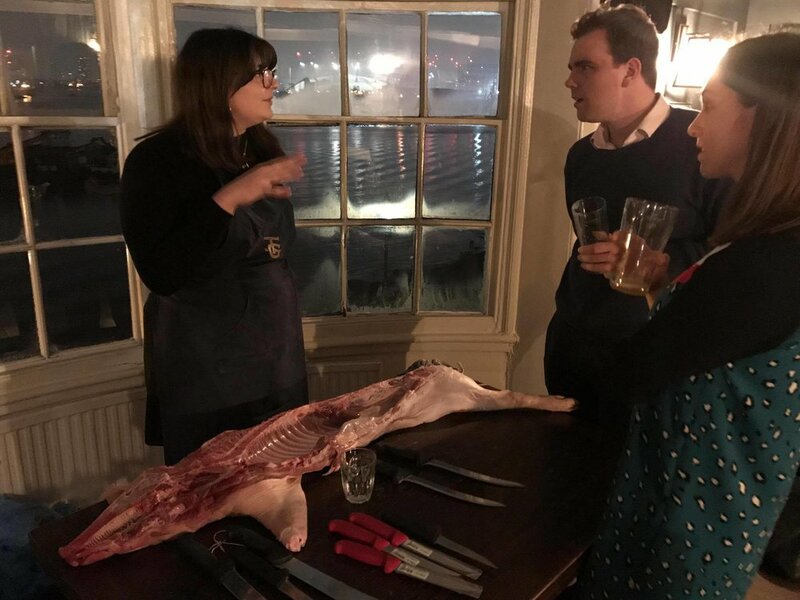 It’s great to see new drinkers of the spirit embark upon their journey of whiskey discovery through unconventional introductions like ‘butchery’ as it highlights the accessibility of the spirit over and above that of its Scotch counterpart. Tonight was a ‘tweed free’ zone that initiated a few more to the growing scene and for that Alex, Jeevan, Jess and the Cutty Sark, the Bourbon Society salute you.